FORT MYERS, Fla. - Clay Buchholz idolized John Smoltz growing up, so it felt good yesterday when Smoltz approached him before his start against the Orioles. "He sat down and said, 'Hey, anything that you need to know?' " Buchholz said. "He said he feels like he's been in the same position as me early in his career as far as people telling you, 'Hey, you've got really good stuff. You need to learn how to use it.' It's been good so far having him." 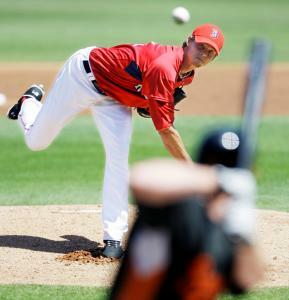 Smoltz then gave Buchholz one pointer: "Go out there and know what you want to do prior to even warming up." Smoltz's counsel helped Buchholz prepare for his best start of the spring, a dominating three innings in a 5-1 loss to Baltimore. Buchholz retired all nine batters he faced and struck out two against a team that clobbered him last August in the start before his demotion to Double A Portland. Now Buchholz is pushing for a return earlier than expected. "I don't even know if it's anything I have to do now," Buchholz said. "It's in the organization's hands. I feel I've gone out and showed them that I worked out in the offseason and did whatever I needed to do to get better. I think I'm sort of maybe a backup plan as of right now. And if not, hopefully that fifth spot is there in the rotation for me. "I feel like that I'm showing them I'm a big league pitcher now, not just a guy coming out here and throwing the ball to a catcher with no confidence. I've gained a lot of respect in the past month that I've been here." Buchholz has rebuilt his confidence, which showed yesterday when he casually shook off catcher Jason Varitek and threw "the pitches I wanted to throw." Baltimore's Matt Wieters, regarded by many as the best prospect in baseball, swung through two straight changeups as he struck out, and Scott Moore looked at a vicious 12-to-6 curveball for strike three. In all, Buchholz needed only 31 pitches, 24 of which were strikes. "That's probably the most confident I've been that I can even remember," he said. "I definitely felt good. The best outing I've had in a long time." And the assist goes to Smoltz, whose presence Justin Masterson also raved about this spring. Although Smoltz is rehabbing and has yet to throw a pitch, the Red Sox have already felt his impact. "It's a great thing to have anybody that caliber being able to come over to you and talk to you on an everyday basis," said Buchholz. "He's always making comments about 'God, I can't wait until I'm back out there throwing.' It just shows how much determination that guy has to play the game for as long as he has and still wants to be playing. "He's just a big asset to the team, I believe, to the younger guys - me, Masterson, [Michael ] Bowden, all the younger guys that he talks to." Brad Penny threw 20 pitches of live batting practice, another "encouraging" step toward his spring debut, pitching coach John Farrell said. Penny worked at 90-95 percent capacity, according to Farrell. He is scheduled to pitch Friday in a simulated game with minor leaguers. If all goes well, Penny could pitch in a Grapefruit League game the middle of next week. "He's getting to the point where the baseball adjustments are taking place," Farrell said. "The condition of his shoulder is almost in the back of his mind. Now it's a matter of repeating his delivery, feeling his timing, being erratic at times and making the adjustments to correct it. When you hear a pitcher make comments along those lines, then you know that the physical ailments are not even being thought of. Those are all encouraging signs." Penny made three trips to the disabled list last season owing to right shoulder injuries, and he experienced fatigue in his shoulder early this spring. A day after David Ortiz told Newsday, "I'm not a first baseman," he was in the lineup last night at first base for the Dominican Republic's World Baseball Classic game against the Netherlands. Manager Felipe Alou wanted Hanley Ramirez and Jose Reyes - both shortstops - in the lineup, so Ortiz had to vacate the DH spot. Ortiz told Newsday he didn't want to play first because he feels soreness in his left shoulder when he throws, though not when he hits. Sox manager Terry Francona reiterated yesterday that Ortiz's health was not a concern. "If it was an issue, it would show up in their reports, or with David telling us," Francona said. Jed Lowrie returned to the lineup at third base a day after he committed two errors in the same inning at shortstop. Lowrie played next to Julio Lugo, the man he is competing with for the shortstop spot. Lowrie, who handled all 155 chances at shortstop last season without committing an error, chalked up the difficult inning Monday as a learning experience. "It's one of those things you have to go through," Lowrie said. "I feel like it was a couple of feel plays where I tried to do a little bit too much. On a slow roller, instead of trying to just get one out, I tried to turn a double play. That's one of those things you can't practice in the offseason. You just have to go out there and work through it. It's one of those situations that you learn from, you take the information and you use it in the regular season where it really counts." The Sox assigned pitchers Charlie Zink, Dustin Richardson, and Kris Johnson and catcher Carlos Maldonado to their minor league complex and optioned shortstop Argenis Diaz to Portland. The cuts were the first of the spring. Diaz, rated the top defensive prospect in the Sox system by Baseball America, committed four errors and went 1 for 16. "By his own admission, he had a tough camp," Francona said. "The thing we've preached to him since we've gotten our eyes on him is 'make the routine play.' And with his talent, the spectacular play will come." . . . Jonathan Papelbon pitched one inning on one day's rest. He allowed one hit - a triple by Nick Markakis - but retired the other three hitters he faced. The Sox agreed to terms with 19 players on one-year contracts, including Jon Lester. The signing was more or less a formality and doesn't affect the long-term contract Lester reportedly is on the verge of signing. It will be overridden by the new contract if and when it is finalized. With the agreements, all 40 players on the major league roster are under contract for the season. Others agreeing to terms: pitchers Bowden, Buchholz, Masterson, Manny Delcarmen, Felix Doubront, Miguel Gonzalez, Devern Hansack, Hunter Jones, Wes Littleton, and Ramon Ramirez; catchers Dusty Brown, George Kottaras, and Mark Wagner; infielders Diaz, Lowrie, and Chris Carter; and outfielders Jacoby Ellsbury and Jonathan Van Every.